How to Apply : Duly completed application form in the prescribed format with self attested required enclosures must reach by registered post only to the office of the Registrar, SIDDHARTH UNIVERSITY, Kapilvastu, Siddharthnagar - 272202 (UP) on or before. 28/04/2016. 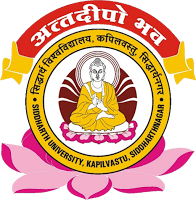 Please visit Latest Notification section at http://www.sidunikapilvastu.edu.in for all the details and application form.